Fanzones provides differentiating omni-channel retail entertainment solutions, through our unique interactive on-demand customization technology, while supplying the highest quality authentic jersey componentry. The Fanzones team will go the extra mile for our partners, creating turnkey solutions and responding quickly to their needs. U.S. drop-ship program fully operational, enabling large-scale customization for Fanzones partners. Las Vegas Golden Knights’ Adidas jersey launches, featuring new advanced perforated numbering program. World’s largest Fanzones program launches for opening of SunTrust Park in Atlanta, featuring full suite of Fanzones technology. 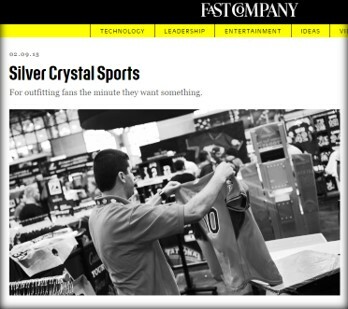 Fast Company names Silver Crystal Sports as one of the world’s 50 most innovative companies and #1 in global sports technology. Fanzones launches at Canada’s largest sports retailer, Sport Chek. Now in 200 locations and counting. First international deployment – Nissan Motorsports Racing in Australia. Fanzones debuts at NFL Super Bowl (XLV) with fully portable, large-scale setup. First Fanzones Jersey Rollercoaster deployed at Air Canada Centre. The first Fanzones launched at MLB All-Star game in St. Louis. First Fanzones kiosk deployed at Wells Fargo Center, changing the sports customization landscape. First Fanzones major on-site event supporting 2003 NHL All-Star Game. In the summer of 2005 Adam Crystal and Jeffery Silver formed a partnership creating Silver Crystal Sports Inc.
With their great passion for sports and entertainment Adam and Jeffery have been able to develop a unique and powerful business that caters to providing customizable “on-demand” products to Retailers all around the world. By taking traditional manufacturing techniques and merging with interactive digital technologies the Fanzone program stands alone on providing the ultimate point of sale experience. Creating the story of “Retail Entertainment” has been the common goal in defining the Fanzones unique capabilities for all its partners. As a Global Leader in providing customizable applications for all aspects of sports apparel industry this partnership continues to grow to over 400 locations globally. All of our customers are truly our partners in building their brand and interactive experiences for everyone’s goal of success. The Silver Crystal Sports team has been able to provide an Omni Channel experience to all sports and entertainment fans around the world. Our Story will continue to move forward as we advance in technology and our manufacturing techniques.